Apologies for lack of posts lately. I have just returned from an extended visit to Syria and the border towns of Lebanon/Syria. My visit included meeting with Syria’s President, Bashar Al-Assad as part of the US Peace Council delegation itinerary. “Damascus, SANA-President Bashar al-Assad said the policy of the US administration in the region goes against the interests and values of the American people, adding that they are getting increasingly violent at the expense of logic and common sense. During his meeting on Thursday with the US Peace Council delegation currently visiting Syria led by Henry Lowendorf, President al-Assad said the US policies are at a collision course with the interests of the US citizens and the peoples of the world, indicating that the role of the United States as a superpower should otherwise be positive and based on fostering knowledge, science and technology instead of chaos and destruction. 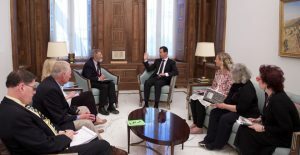 President al-Assad gave a concise review of the events in Syria since the start up until now, indicating that the crisis which later morphed into a war on the Syrian people was prompted by Syria’s rejection to have a regional role that runs counter to the interests of its people. The delegation members said their visit is aimed at having a close look into the situation in Syria and conveying their first-hand accounts to the US public opinion, vowing to do their best to stop the war and US and Western interference in Syria. They underlined their vehement opposition to the US belligerent and interventionist policies, pledging to exert efforts to change this policy. President al-Assad, for his part, praised such visits for their importance in helping governments change their policies if they are willing to. In a statement to journalists, Lowendorf said the delegation held “fruitful and constructive” talks with President al-Assad. “When we reach the stage where the countries involved in conspiring on Syria and in shedding Syrian blood stop supporting terrorism, then we can say that we are in the last quarter, because other details that are called a political solution or a political track or anything similar become simple details and of little value, and when we say ‘of little value’ this means that they aren’t essential in resolving the crisis, and they become details on which an agreement can be reached. Now, they propose that there must be dialogue with political forces to reach a solution for the crisis, and we say there’s no reason not to do so; let those forces that present themselves as representatives of the Syrian people come and prove that they represent them or have influence, and we would hold dialogue with them without hesitation. This is what is called the political track. Thank you. Way more to come, just trying to catch up. What IS this outfit? See comment.